Idiopathic Intracranial Hypertension Treatment Trial (IIHTT). What Have We Learned? Results of the IIHTT were published in the April 23, 2014 edition of the Journal of the American Medical Association (JAMA). Click the title of the article below for the full text. Effect of Acetazolamide on Visual Function in Patients with Idiopathic Intracranial Hypertension and Mild Visual Loss: The Idiopathic Intracranial Hypertension Treatment Trial. JAMA 2014;311(16):1641-1651. http://dx.doi.org/10.1001/jama.2014.3312. What is the Idiopathic Intracranial Hypertension Treatment Trial? The Idiopathic Intracranial Hypertension Treatment Trial is a multicenter, double-blind, randomized, placebo-controlled study of acetazolamide in 165 IIH participants with mild visual loss. All participants received a lifestyle modification program that included weight reduction with a program emphasizing lifestyle management and a low sodium diet. The main purpose of the trial was to determine the effect of acetazolamide in reducing or reversing visual loss after 6 months of treatment when added to the weight reduction program. Secondary purposes were to determine if acetazolamide lowered CSF pressure, improved quality of life and decreased optic nerve swelling. The structure of the trial is outlined in Figure 1. Figure 1. Study design of the IIHTT. Idiopathic intracranial hypertension (IIH) is a disorder primarily of overweight women of childbearing age characterized by increased intracranial pressure with its associated signs and symptoms including debilitating headaches and vision loss in an alert and oriented patient. Neuroimaging and CSF analysis are normal except for raised intracranial pressure. Also, no secondary cause of intracranial hypertension is apparent. The above features comprise the modified Dandy criteria for IIH and were necessary for entry into the trial. The other important entry criterion was having mild visual loss. This was defined for study purposes as having a mean deviation (measure of average loss across the visual field on an automated visual field test) of from -2 to -7 dB. Additional inclusion and exclusion criteria can be found in the pdf of the primary outcome paper by clicking on the link at the top of the page. What did the trial conclude? In IIH patients with mild visual loss, it was found that subjects taking acetazolamide, a type of diuretic, along with a low sodium diet program had significantly better visual outcomes than those taking placebo along with the diet. In addition, the patients taking acetazolamide also had significantly improved papilledema (optic nerve head swelling), quality of life measures and lower cerebrospinal fluid pressure. Figure 2. The acetazolamide-plus-diet group in red had a statistically significant improvement in visual field mean deviation with most of the change occurring in the first month. Figure. 3. Change in CSF pressure. Both the placebo-plus-diet in black and acetazolamide-plus-diet groups in red improved from baseline but the acetazolamide-plus-diet group improved about twice as much. Figure 4. Change in papilledema grade. 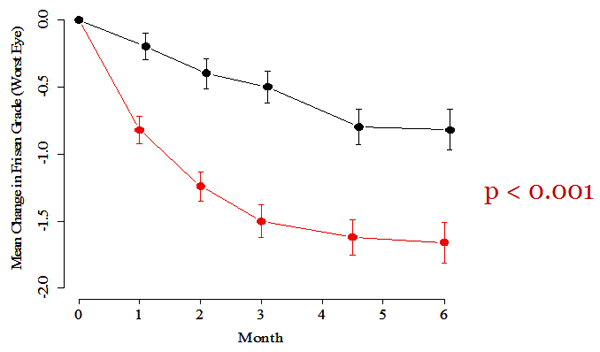 Both groups improved from baseline but the acetazolamide-plus-diet group in red improved much more. What was new or unusual about the findings? This is the first time there has been proof that acetazolamide use in IIH improves visual outcome. The beneficial effects of acetazolamide and diet are independent. So, although the acetazolamide-plus-diet patients lost twice as much weight as placebo-plus-diet patients, the acetazolamide effect on PMD was independent of the weight loss. The average weight loss in the trial was 6%. The patients with moderate to severe optic nerve swelling recovered substantially more vision than those with mild swelling. Acetazolamide has its greatest effect on visual field function and papilledema in the first month of escalating dosage to the maximum dosage tolerated that did not interfere with activities of daily living. Marked worsening of visual field function was much less common in the acetazolamide-plus-diet group compared to the placebo-plus-diet group (6 patients vs. 1) and risk factors for marked worsening were presence of high grade papilledema and lower visual acuity measures at baseline. Many IIHTT subjects tolerated maximal dosages of acetazolamide up to four grams per day. While there were many expected side effects, quality of life measures were significantly better in the acetazolamide-plus-diet group. There was no permanent morbidity (bodily damage) from acetazolamide use. IIH patients on acetazolamide as the only diuretic did not need potassium supplementation. What are the broader implications of the findings in terms of clinical relevance? The broad implication is that for the first time, there is evidence from a randomized clinical trial that acetazolamide combined with a low sodium weight reduction program improves vision, reduces optic nerve head swelling, reduces intracranial pressure and shows improvement in quality of life measures. The main implication is there is now scientific evidence that acetazolamide improves vision in idiopathic intracranial hypertension while improving quality of life. What does it mean that the main outcome article concluded the clinical importance of the improvement in visual field function is modest and yet to be determined? While acetazolamide caused a statistically significant effect on visual field function in this group of patients with mild visual loss, the effect size of 0.71 dB may not be a clinically significant amount of visual improvement. However, visual quality of life measures were statistically and clinically significantly better in the acetazolamide group compared with the placebo group. This suggests the effect is clinically significant. Taking into account the IIHTT study design and methods, results, and limitations, how should clinicians apply the findings to patient management? In patients with mild visual loss acetazolamide in the maximally tolerated dosage coupled with a low sodium weight loss program (with a goal of 6% total weight loss) should be used. This is especially true in patients with moderate to marked papilledema. There was three times the visual field improvement in subjects with high degrees of papilledema than with low grade papilledema. Since acetazolamide in the maximally tolerated dosage plus diet significantly lowers CSF pressure, improves general and visual quality of life scores and reduces papilledema, this combination is suggested for all patients with mild visual loss. Patients without visual loss that have grades one or two papilledema may be managed with diet alone. They should be followed closely and if they worsen, acetazolamide can be added. Patients with worse than -7 dB mean deviation can be treated with this medical regimen or surgery but there are no clinical trials to guide therapy. A reasonable compromise in these patients would be to start treatment with acetazolamide-plus-diet and go to surgery if there is any worsening.